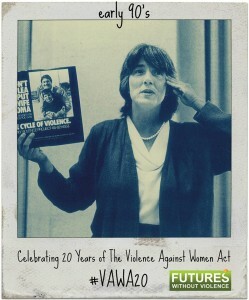 On September 13, 1994, Congress passed a groundbreaking law called the Violence Against Women Act. The bill finally put the full force of the federal government into efforts to stop domestic violence and help victims. Not only did it reshape our criminal justice system, and introduce training for judges and law enforcement, it provided the funds for a national network of shelters, services and supports. Since its passage, domestic violence against adult women has declined 64 percent. FUTURES, or The Family Violence Prevention Fund as it was called at the time, was there from the beginning. Throughout the 1980s, we worked with grassroots organizers all over the country to protect battered women and broken families. Working with a group of passionate advocates in the early 1990s, we insisted that it was time for Congress to change laws and provide funding for shelters, support services and revisions in the criminal justice system. In the past 20 years, the law has become a catalyst for improving response to violence against women from our health care system, children’s programs, and social services agencies. The Violence Against Women Act was reauthorized by Congress in 2000, again in December 2005 and again in 2013, after a long legislative battle throughout 2012–2013.